Let me take you back to Princetown on the morning of Tuesday the 4th of June 1907. It’s ten o’clock and Princetown is suddenly engulfed in a shroud of thick Dartmoor fog – nothing new there then. Through this opaque wall of mist can be heard the sound of horse’s hooves and trundling carts slowly clomping down from the Prison Quarry towards the prison farm. All of a sudden the two carts at the back of the procession begin veering off of the track. 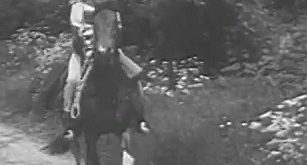 One of the horses jumped over a low wall and was charging full pelt down the slopes of a field. The whole column was immediately stopped whilst some warders went to investigate why this was happening. The reason soon became apparent, the horses were without the prisoners who should have been leading them. Thanks to the dense fog the two men had taken the opportunity to ‘do one’ and quietly slip away unnoticed into the opaque miasma. The two escapees were Thomas Ellis and Alfred Parish both aged 21. Ellis who was a tinsmith by trade was serving to a three and a half year sentence for larceny and Parish a similar term for breaking into a London warehouse. On discovering that the two convicts had escaped the warders raised the alarm. The warder in charge of the train of carts blasted on his whistle and the armed guard at the head of the column managed to fire off two rifle rounds in the direction of where he thought the men were heading. The red flag over the watchtower at the quarry was raised and bells rang at the prison. A well practiced drill then took place with armed guards sent scattering across the moor in search of the escapees, some on foot with others on horseback. Other posses of men also patrolled the four main roads which radiated from the prison. By this time heavy rain had added to the embuggerment of the thick fog making their task that much harder. Meanwhile messages were sent to all the local police stations and word soon got around the Moor that two convicts had escaped. On such occasions the moorfolk living near the prison greeted the news with mixed emotions. Some would view the situation with apprehension whilst others relished the prospect of a reward should they recapture the convicts. Not far from the direction in which the two men had fled one of the warders found a clue as to the route they were taking. Both men had discarded their prison boots whose soles had a distinct prison arrow mark in their hobnails. Considering the weather and the terrain they were crossing this must have been a difficult decision to make. Whilst making it much harder for them to be tracked it did mean their speed of escape would have been slower as they would be bare-footed. By around seven thirty that night neither sight nor sound had been made of the escapees. The heavy rain and fog continued to hamper the search and so relief parties of wardens were sent out with orders to remain all night if necessary. On the next day, Wednesday the 5th of June, neither hide nor hare had been found of Ellis and Parish. What was certain was the fact that they would have spent a miserable night on the Moor. The prison garb would have afforded little protection from the wet and cold, they were barefooted and probably starving and exhausted. At around two o’clock that same afternoon Mrs. French went to her hens-house to collect the eggs. Her and her husband worked Hartyland Farm at Postbridge which is some six miles from the prison. On approaching the house she heard an almighty racket coming from inside it. Her first thought were that a moorland fox had got inside and was creating havoc. But much to her surprise the door slowly creaked open and two men slowly emerged, looking like drowned rats. Both were freezing cold, wet, exhausted and starving. They pitifully implored the farmer’s wife for some food. Now being of stern Moorland stock Mrs. French was unphased by the situation. She told them to make their way to the farmhouse where her husband was sure to find them something to eat. The two convicts eagerly made off towards the house. Meanwhile Mrs. French went in search of a fisherman who she knew was nearby. He was then instructed to got to Postbridge and find the warders who were stationed there and tell them to get to the farm where they would find their missing men. Whilst this was happening Ellis and Parish had reached the farmhouse where they met farmer French. Rather unnervingly he noticed that one of them was carrying a large piece of iron. It was soon made clear that if they wanted food he wanted the iron weapon in exchange. Such was their desperation for sustainance and warmth that they gladly agreed and were led inside. Whilst eating their meals the two men explained how during the night they had unknowingly ventured into Rowtor Marsh. Clearly they never knew anything about their location but soon found out it was not the best place to be. Now, in wet conditions any moor traveller will know or soon find out that this is not the best place to be, especially in the black pall of the night. They apparently found themselves sinking to various depths in the black, murky bogs and decided to hunker up for the night in what little shelter they could find. Come daylight the two men decided they would try and find a house or cottage where they could get food and shelter. The shelter came in the form of Mrs. French’s hen house where they would hide until nightfall and then look to breaking into the house for food and fresh clothing. Having eaten their much needed food for some strange reason they were under the impression that Mr. French would then wave them on their merry way. Clearly they had underestimated Mr. French and they were detained until a party of warders arrived. Additionally they were equally astounded to learn that their Moorland ordeal had taken them a mere six miles from the prison. As can be seen from the photograph above, Ellis and Parish were bundled into a wagonette and transported back to Dartmoor prison. I don’t know which ones face can be seen but swaddled into blankets he almost has a look of relief that his ordeal is over. I would also imagine that despite the hardships of life at Dartmoor prison they would be much preferred to another night on the cold, wet merciless Moor?